Africa came to the United States as a 14 week old puppy. She's very typical of Bryan Kelly's (Cottoncove) - Rosemary Smith's (Smithvale) breeding. 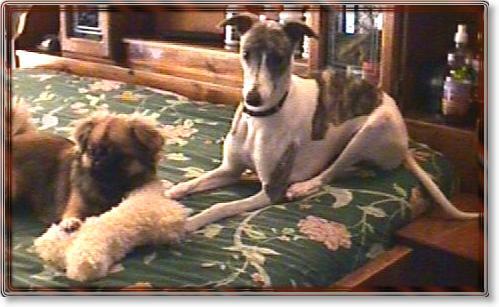 She looks very much like her sire (see photo). 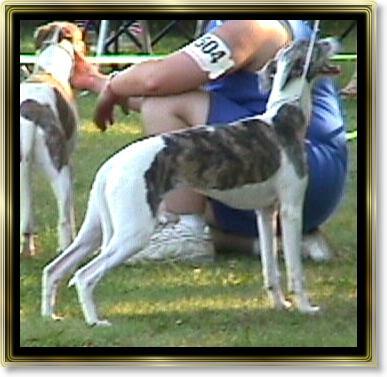 This perky, self confident, full of personality Whippet comes from a long line of proven show Whippets and can be seen in the show ring here in the United States. Plans are to breed her at an appropriate time. 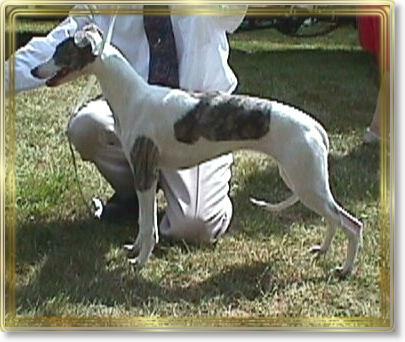 Africa and Spirit are the first two South African bred Whippets to be imported to the United States. Thank you Brian Kelly for entrusting Africa to us.